I recently listened to Gretchen Rubin's Happier Podcast Episode 147: 18 for 2018. The idea is instead of traditional New Year's resolutions, to develop a list of things to do in 2018. The items can be one time things or daily/monthly things; such as Try Spin Class or Make My Bed Every Day, respectively. Each item though is supposed to add to your overall happiness. Gretchen Rubin talks a lot about how accomplishing things in an atmosphere of growth brings happiness. If you haven't, check out her book The Happiness Project. Last year in my Preparing for 2017 post, I wrote about journaling and setting goals. I loved my new planner's format and used it pretty faithfully all year, except for the three months I was on maternity leave. Part of my success was updating my planner while at my work desk Monday-Friday. This really kept me on top of updating it and encouraged me think about goals and tasks. I did not like the Level 10 Life format for goal setting which I mentioned in my post. I found too many of the categories didn't really apply to me and I was losing space for To Do's and goals which were more important to me. This week my Ink + Volt Planner's writing prompt was: "Fast forward five years. What advice do you think your future self would give you?" I read the prompt and found myself writing the first things that entered my mind which were: "Enjoy the little moments. Find joy in your children. Let go of anxiety." 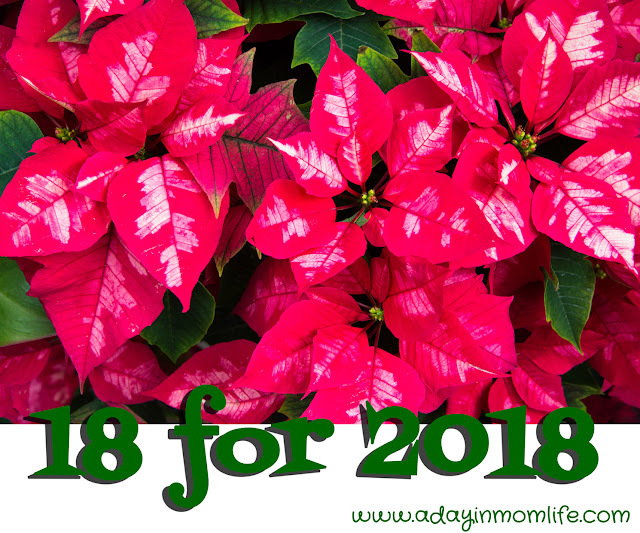 Building on that...here are my 18 for 2018, grouped into two categories: Personal and Family. I decided on this instead of the more nonspecific "learn something new," this way I can learn something new or just enjoy a fun or silly podcast. I've really fallen away from reading, instead watching Netflix while I use my spinning bike. I'm disappointed in myself for this and want to get back to reading more books. 3. Blog once per week! This blog is really important to me and I'd love to keep it more updated. This is a lofty goal as I first need to finish my 2017 book in which the last page completed I was 38 weeks pregnant! But keeping the photobook updated every month makes it so much less daunting so it's an important goal for 2018. My Fit Bit has re-energized me toward walking. One thing I miss most about having a dog (beyond missing Frisco for himself) was that as a responsible dog owner, I took my dog for a walk nearly every day. I also want to start jogging some, to mix up my workouts. So my daily walk can be any walk more than 10 minutes and if I jog that can replace the walk (but biking does not fulfill the goal). I wondered if "daily" was too frequent a goal, but I think I can do it! Along with starting some jogging again, I'd like to go to yoga classes or even try Burn Boot Camp. I've already started on the planning stage for this and I'd love to get it done this year! I'm pretty good about basic cleaning but I hate mopping my floor. I vacuum it weekly or more as needed...baby and toddler dropping food... It really needs to be mopped at least weekly to pick up food debris, remove dust, and condition the wood. Seeing my floor clean does make me happy, but trust me the monthly goal is plenty aggressive considering my current rate of mopping! Things are how you perceive them and keeping a positive attitude makes that 40 hours a week much more pleasant. Lately, I find myself falling into the trap of negative thoughts, so my goal is to identify negative thoughts, re-frame them in my mind, and then dismiss them. I have no illusions about us planning this soon (breastfeeding...) but I don't see any reason why we couldn't manage it sometime in 2018. Again, here the "start" word is key. Before the end of 2018, I'd like for my husband and I to begin enjoying monthly date nights out. I've done weekly meal planning in the past, but I'd like to transition to monthly plans. This Post from one of my favorite blogs inspired the monthly idea. I hope to get a better overview of what we are eating and work in some more variety! I read a fair share of baby books, but I must confess I have not finished a single toddler parenting book. I've heard great and also very critical reviews of How to Talk so Kids Will Listen & Listen so Kids Will Talk, but the title itself seems to sell it. I'd also like to read a book specific to Bringing Up Boys. Ha! This one is embarrassing... I think if I was a stay at home mom it would be no problem, walks in the neighborhood, story time at the library, trips to Target and the grocery store, etc... But because my husband and I both work full time jobs and our kids are not in daycare and have different nap schedules... Sometimes we just don't get out, especially if the weather is bad on the weekend. Introducing my toddler to new things is key for me this coming year. I think this will be harder in January and February while I'm still breastfeeding, but as Lucas approaches and passes his first birthday, I want to be sure we plan something fun to do each month. A piggyback off the previous item, I'd really like my toddler to start a part time program at age 3. Most of the "schools" here which offer part time start in the summer. I've already selected my school of choice, but I'll find out at the start of February if they will have any openings for their morning 3-year old session which starts in August. If not, I am not willing to enroll Henry in the afternoon session. I think we both will still need him to be getting a daily nap at age 3. If there aren't any openings I need to consider other programs. I'm really excited about this one! A friend of mine took her son to swimming lessons locally nearly 2 years ago when her son was 9 months old. She asked if Henry and I wanted to join, but Henry was not even crawling yet. Then last year I was pregnant with Lucas and then breastfeeding a lot. But this is our year! Henry loved going to our neighborhood pool last summer so I'd like to do swimming lessons with him this spring. This is probably the most difficult item on my list. Although the happy potential is through the roof here, travelling with two small children is so stressful...just the thought of it! We have not traveled to visit family and friends since before Henry was born in June 2015. It is time. We will have 2 nephews in MN and a new niece in NJ to visit this year! The plan is set! Accountability is key though... I'm going to add my 18 for 2018 to a monthly spreadsheet so I can keep track of how I am doing. I listened to that podcast too and want to make a list in the next couple of days! It seems much more fun than traditional resolutions somehow. Thanks for mentioning my blog!! I'm going back to work part time next month, so I feel like a lot of my list will revolve around that. Happy New Year!!! Happy New Year to you too! I really liked picking out 18 things, it got me thinking about long and short term goals for the year. Good luck with returning to work part time, I hope January treats you and your family well!